Dans l'aéroport international de New York JFK, après avoir passé la sécurité, dirigez vous vers les portes 1-7 et tournez vers votre droite. Notre Spa est situé juste en face de la porte n°6-7. 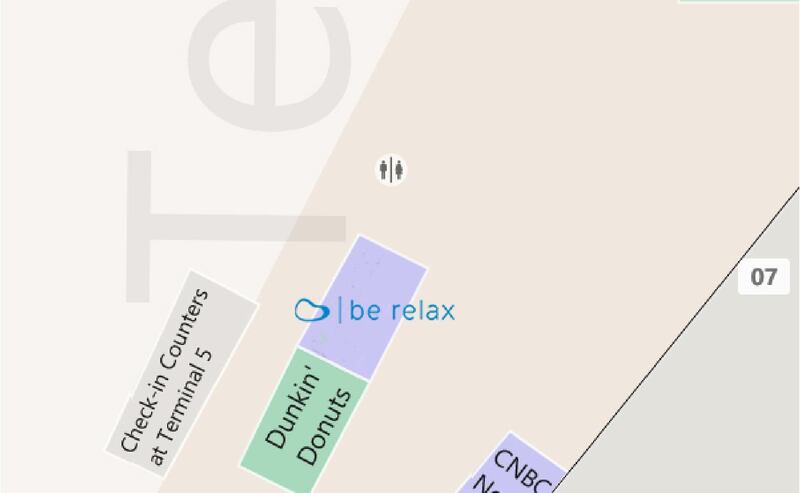 Bienvenue chez Be Relax New York ! I became a Licensed Massage Therapist a little over three years ago. My desire has always been to be instrumental in someone’s healing process. When I first came to Be Relax, I made it my business to ensure that each customer was received with the best customer service and massage money can buy. Today I am proud to say I am now the General Manager of the Be Relax Spa at New York JFK International Airport. At Terminal 5, the spa is located a little off the beaten path, but its professional staff is always there to greet each customer and invite them to participate in a relaxing service. Often times I hear the customer say, in great surprise, “I never thought I’d get such a good massage at an airport!” At Be Relax we pride ourselves in our customer service as well as our professional relaxing services, be it a massage, nails, hair waxing or facials. We also offer oxygen or aromatherapy with each service. It is a very relaxing and a sweet add-on that enhances the experience. The oxygen is refreshing and relaxing, while providing 50% more oxygen to the brain. The aromatherapy comes in two scents, Serenity and Invigorating. Serenity is an orangey smell that soothes and relaxes, while the Invigorating is a fresh minty smell that wakes up the senses and is great for concentration and alertness. Come by and be relaxed by us at Be Relax, where your journey into well-being starts today.